Lumon offers a variety of shades and blinds that are designed with our highest-quality fabric and custom made to fit your balcony or sunroom enclosure. Our screens helps maintain your space by reducing the heat in the space, keeping unwanted insects out and maintaining a little privacy. Lumon retractable insect screens are designed to work perfectly with your Lumon designed sunrooms and/or balcony glass so that you can enjoy the great outdoors in Canada while keeping the pesky insects, autumn leaves and floating debris outside. This options allows you to enjoy your solarium as an opened space without worry of unwanted elements ruining the experience for you. The morning sun, hot weather at noon, privacy in the evening: these are kept under control with Lumon sun-protection shades. Every moment on your dream balcony or sunroom can be agreeable and pleasant for your personal preferences. With the Lumon shades you make a glazed balcony, or enclosed sunroom more enjoyable. With the Lumon sun-protection shades you can adjust the amount of light and visibility from the outside to the inside. 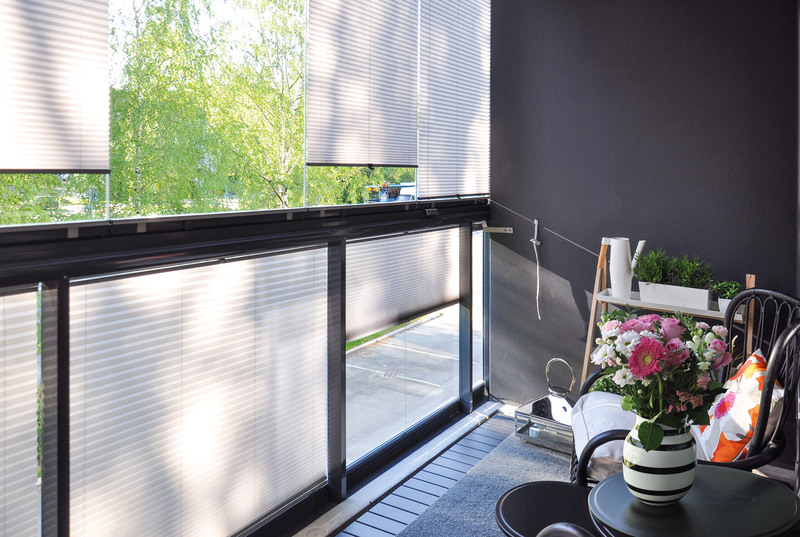 The shades backside fabric is of thin metallic film which reflects the balcony's incoming solar radiation effectively and protects your apartment from excessive heat, and additionally it provides the homeowner with an easy maintenance process. All you have to do, is enjoy! With so many styles to choose from, finding the right one for your needs isnt always a quick deal. Looking for privacy, but also style? Comfort but also flexibility? How formal should you go? How sheer? Thankfully, with Lumon we can put your mind to ease by setting you on the right track. Our sunroom and balcony shades are custom made to fit perfectly with your exisiting Lumon products. You can purchase high quality, durable and stunning blinds that are the perfect compliment to your glass panels. We take pride in our products, quality and installation process. Lumon is supported by knowledge and experience to deliver the highest quality materials to our consumers. We are dedicated to ensuring that you recieve the experience that you deserve with our screens and blinds, patio covers, sunrooms or balcony glass installations. We offer warranty on our products and materials. Additional warranties apply within certain product ranges – speak with your local design consultant for more information. Our glass systems are a great focal point in a room, here at Lumon we believe our sun-protective shades should compliment the design in a both decorative and functional manner. Visit our gallery to browse through different looks and get motivated to decorate your space in a way that will dress up your home. At Lumon, we've created a better, affordable and durable design that maintains a beautiful appeal and we are proud to offer them to you. Looking for versatility and style? Our custom-made sunroom shades and screens are the perfect companions to our glass sunrooms and balcony enclosures. Create a peaceful and beautiful oasis of fun and relaxation! Sunroom shades allow you to precisely control direct sunlight, while screens let warm breezes pass through while keeping bugs at bay. Because they're custom-made by us, they work perfectly with your Lumon glass walls and ceilings.